For the year 2012 (which is from January to July), I could only managed to publish less than 30 posts!! OMG! I know 30 posts in 7 months are so damn less. I feel so sorry to all my lovely readers for my MIA these few weeks. Anyway, a bit update about my wedding!! By the time I am writing this post, my 150 paper bags and the 150 paper tags are done(Yuppie!!!). As most of you know, I will be getting married this 8 December 2012. I am greedily happily planning to DIY so many things. 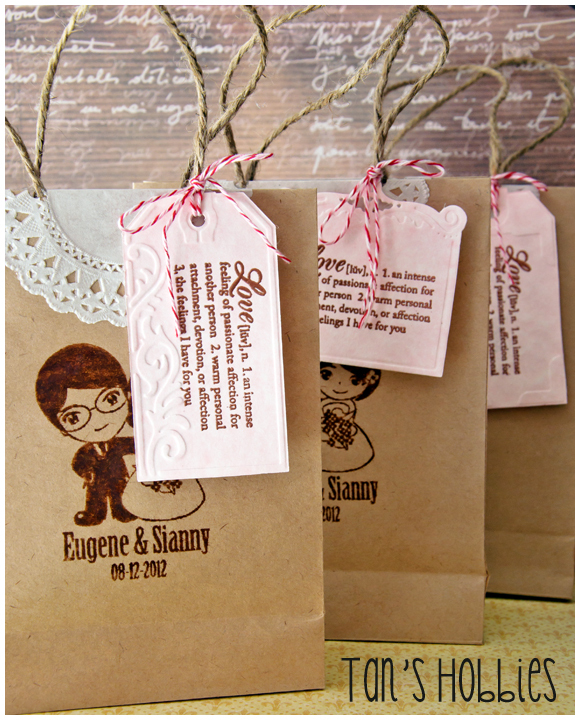 For now, I just completed the paper bags and tags, but I still need to make another type of tag to be attached to our wedding favor. I also still need to make the place card, design the guest book, wedding corsages and boutonneire for my helpers, etc., etc. !! I hope I can complete everything in another 3/4 months!! On my special day, I will be the bride (of course, hehehe) and the wedding planner as well. Hope everything will be smooth!! PS: A big thanks to one of my lovely and super talented, Annette!! Last month, she sent me a super duper lovely package. I am so happy!! Thank you so much, dear!! I love her DIY card so much. She is the queen of twines and her coloring skill is superb! 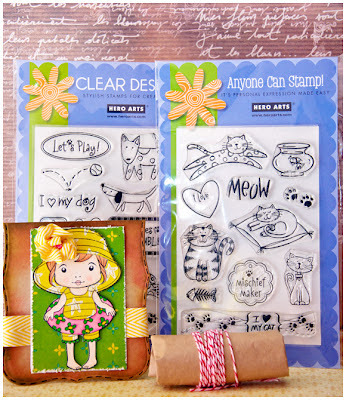 Please visit her blog to view all her lovely creations. This are all cute wedding cards..It is so sweet.Thanks for the share. You don't have to excuse yourself, preparing a wedding is a very,very busy time.But it's also a lovely and exciting time. 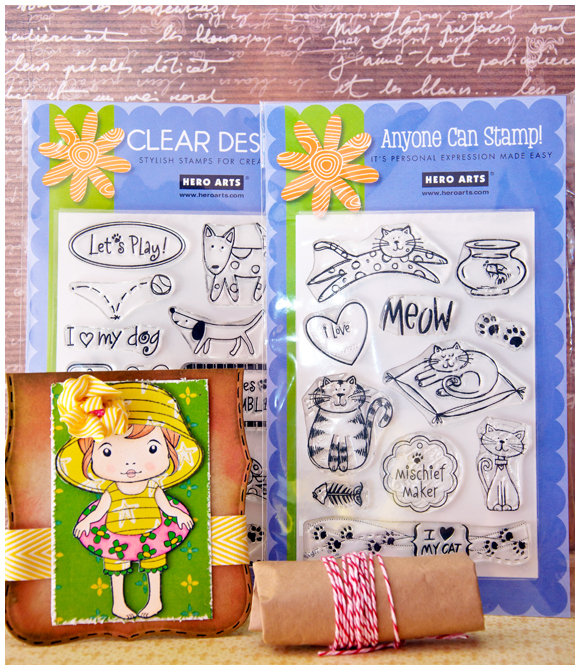 I really love the tags and cards, they are lovely and delicate. You asked me,if a made the hankerchief, yes I did and you know what? It's a bridal hankerchief!!. I love such romantic items. Gosh Tan you have too much to prepare to worry about lack of posts...your wedding will be ere quicker than you now it.. Your bags and tags are awesome!, dont worry about posting as you are a busy lady and have good cause,we all understand. so excited for you and know the wedding will be awesome!!! I've been a bad blogger too, but not because I'm planning a wedding! Girl those are some really gorgeous tags and the bags are soo cute! Congrats and don't worry, once the festivities are over, we'll see you then! Wonderful projects - how proud you must be. I know everything will go smoothly on your special day and you are making it so very special. Yes, I was thinking about you, and I thought I might missed your blog, and sometimes visited your blog. Finally I am HAPPY to see your new creation. (^.^)/"
Wow,I am soooooooo proud of you,flower !!! You've been working sooooo hard and doing GREAT JOB for your wedding !!! That is soooooo WONDEFUL to produce yourself !!! Also it is soooooooo NICE for making your handmade presentation for guests. Very warmful and sweet !!! Good luck for next project !!! I know you will be SUPER BEAUTIFUL BRIDE and being PRINCESS !!! (^.^)/"""
Love your bag and tag creations! Good luck with everything! Amazing amazing amazing! You go GIRL! I love your creations and what a special touch you are adding on your special day!